Home Our Garage Door Services Garage Door Repair Do You Need to Replace Your Garage Door Rails? 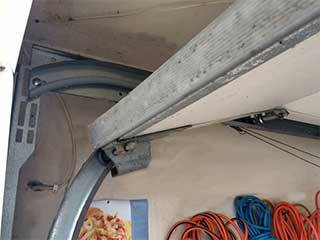 Do You Need to Replace Your Garage Door Rails? Most garage doors are manufactured with a pre-set of tracks riveted together. Therefore, when something with the rails goes wrong, the operation of your door will be affected as well. If you suspect it might be time to replace your track due to a malfunction or improper functioning, here are some of the most common ways to tell it's the right time. Maybe your track has suffered structural damage or it's been incorrectly installed by another company. Regardless of the reason, improper spacing can cause the door to get stuck in the jambs or hit something while in operation. You'll want to have this problem addressed as soon as possible as it can not only be a frustrating but dangerous, too. Installing a new set of rails is your safest bet. You can of course count on Garage Door Repair Glendora to instantly know which model will fit your door and perform the installation seamlessly and affordably. Worn or broken rails often render the door defunct and dangerous. What's more, they can also break, bend, and spring out of the wall in such circumstances. Having your system regularly inspected and looking for signs your door is sliding are the best strategies for preventing the problem from worsening. Pinpointing that loud screeching noise from your garage to its cause is one of the greatest mysteries homeowners face. Oftentimes, it is a signal the rails are in bad shape; they might be bent and worn, forcing the door to scrape against them and make that excruciating noise. However, loud screeching and scratching could also come from your opener, rollers, or loose hardware. If you're unable to identify the noise, schedule an appointment with a technician to inspect and locate the cause. Chances are the problem will require further attention anyway. Again, problems with your rails should be resolved swiftly; the safety of you and your family is at stake. A broken and malfunctioning track can cause unpredictable movement of the door, causing it to come crashing down rapidly. We recommend you have you replace them as soon as you notice any of the warning signs above. If you need to have a new garage door installed, or if you already have such a mechanism but you suddenly discovered a problem, you can count on our team for help. We offer same day emergency repair services, as well as scheduled maintenance visits. Take a look at the rest of our website to find out more. Thank you for choosing Garage Door Repair Glendora! One of our experts will be in touch soon. Feel free to browse our website for FAQ, tips and more useful information in the meantime!